I am pleased to report that that doesn't make me hungry. "We who are about to get dunked, salute you!" Mommy, the scary donut man with the stick-gun in his left hand is in the window again. That's a sword, sweety. Now go to bed, or donut man will gut you. Exactly which "world" are you visiting now, Dave? Dave, you are a strange, strange man. I don't "get" a sword-bearing donut. What's that about? A sword-bearing _viking_ donut, no less..
Actually, it kinda reminds me of the Gary Larson sketch of "Attila the Bun" -- which was a lot like that donut except that it was a bread roll..
i find the sword confusing too. maybe for defending their claim from outraged competitors? Anybody else notice the picture is called 'Dougnut'? Really? Me either! You'd have to be a real [donut]hole to be that picky. If you look behind Dave, under the tree on the left and on top of the giant blue tea cozy, I think you can see Doug's left nut. Okay, Visigoth Dave Donut. Funny and weird. But the important question remains.... Are they the "World's Best Donuts?" The word can be spelled in two ways, the more traditional "doughnuts" or the marketing-friendly "donuts" as in the picture itself. Whoever labelled the picture, though, apparently chose the middle ground, creating a new paradigm. Far be it from me to contradict The Blog, but if you gotta cut 'em with a sword, they are not the world's best donuts. World's best beef jerky, maybe, but pastry-eating should not require the use of combat equipment. But perhaps the sword serves some other, mysterious northerly purpose? Also, are Dave's arms getting shorter, or is that an illusion caused by the curvature of the Earth way up north? Another mystery. Well I guess we know who the donut hole is. Judi - Can you please put james the spammer guy in the boiling donut oil? One that is worthy of imitation or duplication: beau ideal, example, exemplar, ideal, mirror, model, pattern, standard. See good/bad. Paradigm "is a word too often used by those who would like to have a new idea but cannot think of one." BTW Dave... First you eat at Famous Dave's (a rack of ribs I'm guessing)... then off to The donut shop. (your a glazed man, right?) I'm worried about your pipes man. Slow down. Try eating a salad! imho, krispy kreme can't be beat. the spam is now on 3 of the 5 threads. He's got that creepy (crappy?) look of outhouse man. Yes, Dave, make sure you're taking your Lipitor in the land of cholesterol! So, ARE those the world's best donuts, or what? Oh, and I think that object in his "hand" is a frosting gun. Ha ha, Dave. You can't fool me. I know it's you, even with the sunglasses and that clever gladiator thing you have going. Must be the bangs that gave you away. silly folk, the sword is for carrying off the spoils of war. you could thread a lot of donuts on that thing. that looks like candy corn on his head though. i'm aware there is a time difference but didn't know halloween came so early in the midwest. Dave may not know how good the doughnuts are. If you look at the sign that the sword is chopping, you'll see that the store may have been "closed" or possibly "cloven" or "clowning" or "clotted." In any event, Visigoth Dave may not have gotten to plunder the pastry himself but had to just play quietly in the yard with the CrapCam. P.S. Anyone know where I can buy some fiberglass sewing thread or a wooden dog house? I never like to have to look for that stuff and hope that somebody will post a link on every page I ever look at. At least until the folks who spam about it are ripped asunder by wolves, I hope. dave you look like a character from south park. neener. I believe you're on to something, crossgirl. But, I thought we established a few threads ago that doughnut holders looked like a winkus, rather than a sword. Maybe up North these days it's different than it was 28,000 years ago. Also, no matter how good the doughnuts are, why would a visigoth stick his (or her) head in a fishing bobber? I dunno. A guy? Dressed like a donut? That's hott. Mmmmmmm, Ribs and Donuts. Sounds good to me, but why is the north mysterious? we have ribs and donuts in the south too. I don't know about World's Best, but I think the best doughnuts are at Potter's Fine Pastries in Traverse City, MI. Which is fortunately a 3 hour drive away, otherwise I'd be as big as ... well, Dave, in this picture. I'm with cyn here, they're the best - but Dave does look very cute, in a very, very, very dorky way - but that's really his charm, isn't it? Conquering the world in a glaze of glory. The best doughnuts are Schulers. Only two local shops, but they are wonderful. My first thought at seeing Dave in the photo: I'd be pissed, too. anybody who thinks Krispy Kremes are the best needs to get out more. Production line donuts can't compare with the homemade quality one finds at their 'local' doughtnut shop. If you look closely, you'll see that some brave soul is tickling the mighty donut warrior in his left armpit. This is clearly the result of a double-dog-dare, as no one would voluntarily taunt such an imposing figure. I do not envy the man who charges into battle with a whip cream-topped strawberry for a helmet... er whatever that is. ...and I miss her very much. A person never stops missing a good grandmother, much less a great one, like yours. Aunt Nancy - if I could taste your grandmother's donuts in comparison to any of my favorite bakeries, I'm sure that she would win. All I meant to say is that anybody who believes Krispy Kreme is the best can only possibly be comparing those to other chains such as Dunkin' Donuts, Tim Hortons, etc. A hometown bakery would have doughnuts much closer to real homemade. The fact that I'd take a Timmy's over Krispy kreme any day of the week is an entirely different conversation. That was spam? I thought it was blank verse. Now I'm going around the house singing, "Caustic calcined magnesite, magnesite, magnesite...", and (as usual, might I add) MrsDeath is looking at me as though I'd grown a third arm (which I haven't, yet). ceeg22 - you're right. I'm sorry - didn't mean to upset you or anything. Me, I just don't care for anyone's donuts anymore. Guess I got spoiled when I was a kid. Although I must say, my sister's donuts are pretty good - she uses Grandma's recipe. Moving nortward, eh Dave? Beautiful country up there along the "Norwegian Riviera"! I have a similar pic. Great Vikes think alike! Head any further north and you'll be able to check out Tim Horton's--the Canadian Dunkin Donuts. I hope you checked out Sven and Ole's there too. PLEASE check out Gunflint Trail.. It is gorgeous.... and, it has clothes on. yes, Aunt Nancy, I was upset that you accused me of thinking any bakery made real homemade doughnuts! nah, just trying to defend my honor. I've never had any doughnuts that were so good they spoiled me for anybody else's! even though I scorn 'production line' donuts, I'll accept 'em when somebody brings 'em to the office. I'm not particularly picky when I need a donut fix. wow. express a preference opinion and start a silly "my favorite donut's better than yours" argument. seems to me that someone else needs to get out more. happily, the folks i come in contact with in RL have better manners. who says i lost? I got all the pie didn't I? who's arguing, we're discussing. it seems to me that that's what these comments are all about is having discussions. sorry if I offended you by saying that Krispy Kreme are not the world's best donuts. it wasn't the donut knock that i found offensive. it was the suggestion that those of us who like them are somehow lacking. aamof, i actually prefer the donuts at the little beach stand nearby. that's if the regular cook isn't taking a day off. then they're like lead weights. so, for consistency, i like krispy kreme's. but only when warm off the line. when cold, they're kinda bland n yucky. Aunt Nancy, ceeg22, and just sayin' - I suggest we let bygones be bygones and donut preferences be donut preferences. You eat what you like, and I'll eat what I like. Please pass the chocolate Reddi-whip. Oh, and just...who says you got all the pies? dang! you been holdin' out on me?! sure, i'll pass the the reddi-whip! *ewg* *spriiiitz* Hah! Sheesh! I leave the blog to go paint, and look what happens! I find out that redi-whip makes chocolate flavor. I've never seen that! Does it taste good on krispy kreme donuts? 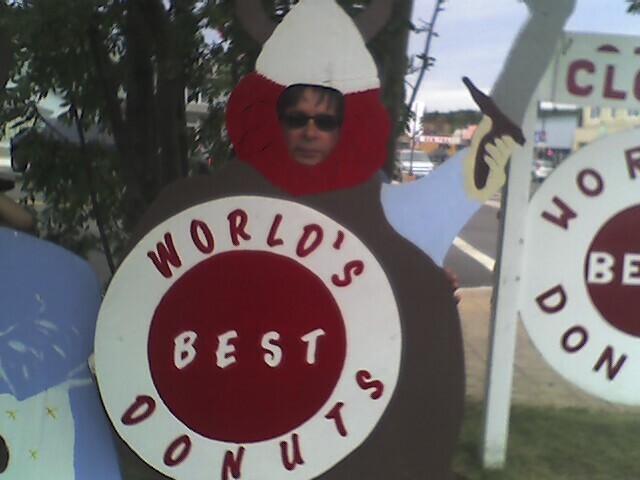 This looks like the World's Best Donuts in Grand Marais, MN. I can't wait each year to take the annual trek up the Norshor with one of my missions to buy some of these donuts. They are absolutely the best raised and cake donuts I have ever had ANYWHERE! I know I have gotten there late when they are sold out for the day, boo. Never before has there been a low fat donut! Our patent pending cooking process eliminates the deep frying! As a result, each Holey Donut has only 3 to 4 grams of fat, not 20 grams of fat like traditional donuts. Yet they taste as good as or better than any donut you've ever had. We make our donuts by hand in small batches, using only the finest ingredients and we never, use any artificial sweeteners or fat substitutes. We wanted you to know why our donuts are different and rather special. The secret lies in our unique* patent - pending cooking process which avoids deep frying like traditional donuts (deep frying produces a fatty, greasy donut with between 15 and 20 grams of fat in 1 donut!) *By comparison, traditional varieties of yeast donuts pack 300 to 390 calories and 20 grams of fat EACH! You could actually eat a box of six of our Amazing Boston Crème Filled Chocolate Frosted Donuts and have LESS FAT THAN 2 TRADITIONAL DONUTS! Holey Donuts!™ produces a light fluffy gourmet donut that you'll love with only 4 grams of fat (or less) per donut! I know it's a famous location near LAX but these guys bought it thru Wendell and it was their cousin RANDY. The simple truth is it would have gone OUTTA business except 4 ONE simple truth, The donuts are wonderful, muffins etc all world famous. I mean world famous in that people come international locations and come get a donut fr: the Weintrabs. I made their website famous and they make U eat donuts once you're inside the building. "World's Best Donuts" winner INTERNET!